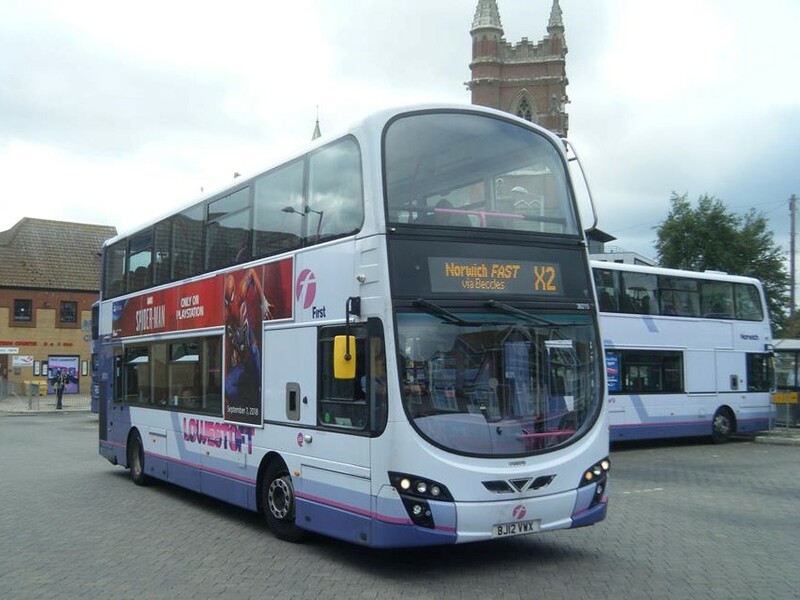 On Friday a post on the First Eastern Counties Facebook Group stated that ex First Leeds Volvo B9 36215 BJ12VWX was on its way to First Eastern Counties for further use. This resulted in some speculation on social media as to which depot it was to be allocated to. It subsequently arrived at First Great Yarmouth's Caister Road premises with First Leeds decals leading to rumours that it was to be based there. However, after the removal of all the Leeds branding it was observed in use at Lowestoft yesterday complete with Lowestoft fleet names. It is seen leaving the bus station at 13:00 on the X2 to Norwich with the decker it's due to replace behind (36271 BG12YKD) having just returned from Norwich on the same route. 36271 should be returning to the city at the weekend for the enhanced University services. My thanks to regular contributor Simon Bartram for the photo.